Exfoliation is vital; it removes dead skin cells, polishes the skin, refines pores and even smooths wrinkles. It also creates a blank canvas that is ready for moisturising or your makeup regime. Knowing how to exfoliate effectively and which method to use can be confusing! 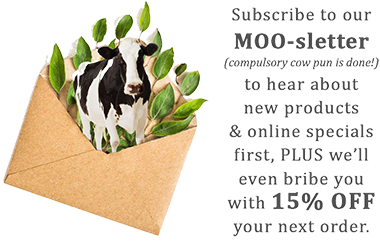 Our MooGoo Herd has put together a list of our exfoliating FAQ’s for you to moo over. What happens if we don’t exfoliate? Is there such thing as over-exfoliating? Yes! Be careful which ingredients your exfoliation products contain. The main concern with some bead or shell particles for instance, (aside from not being eco-friendly) is the abrasiveness. Abrasive products can damage the skin by piercing and agitating the skin, even bursting blemishes. When using skin peels, it is hard to control the layers affected. Our skin is a protective layer, after all, we don’t want to strip it back too much. There are many ways to exfoliate and thankfully exfoliating is no longer limited to intense scrubbing or harsh skin peels. We’ve found a combination of a plant based alpha hydroxy acids, and smooth natural physical exfoliants to be most effective. After lots of fun experimenting on ourselves and gossiping around the .. ahem.. water cooler (champagney water anyway), we’ve made our own Gentle Exfoliating Powder. Well, tell us about it! As many of our herd suffer from skin conditions and sensitivities, making soothing and gentle products is always our priority. We feel that dual exfoliation - meaning both enzymes and non-scratchy physical particles, are the most gentle. Salicylic acid (BHA) is a plant-derived enzyme. It is attracted to oil and exfoliates into the pores, it’s the best thing for a deep cleanse and to address impurities that already exist. Also, we use a very calculated percentage of Salicylic acid, ensuring it is gentle enough for daily use on all skin types. Gentle physical exfoliation is the best thing for preventing impurities and creating an even skin surface, it also stimulates blood flow into the face. We’ve used rice bran as it has a very delicate physical structure and contains anti-oxidant rich, moisturising proteins. The combination of these two magnificent exfoliating components will leave your skin noticeably fresh, glowing and soft. Show us your glow in the comments below!